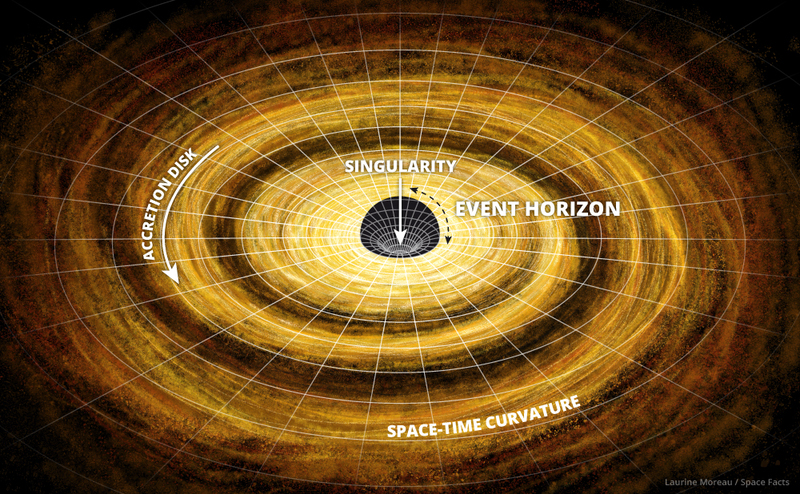 What would it look like in the accretion disk of a feeding supermassive black hole? I wanted two characters unaffected by the heat and gravity to be close to a super massive black hole within the accretion disk, at times moving in orbit and at times completely still. Stars and planets will be engulfed by the black hole. Firstly, your characters also need to be immune to the exotic array of radiation that an active Accretion disc outputs. Thirdly, there are a range of echo images created by a rotating black hole on the 'approaching' side of the disc due to gravitational lensing. These show distorted blue-shifted images of the opposite side of the disc, highly-stretched parallel to the rotation axis of the disc. 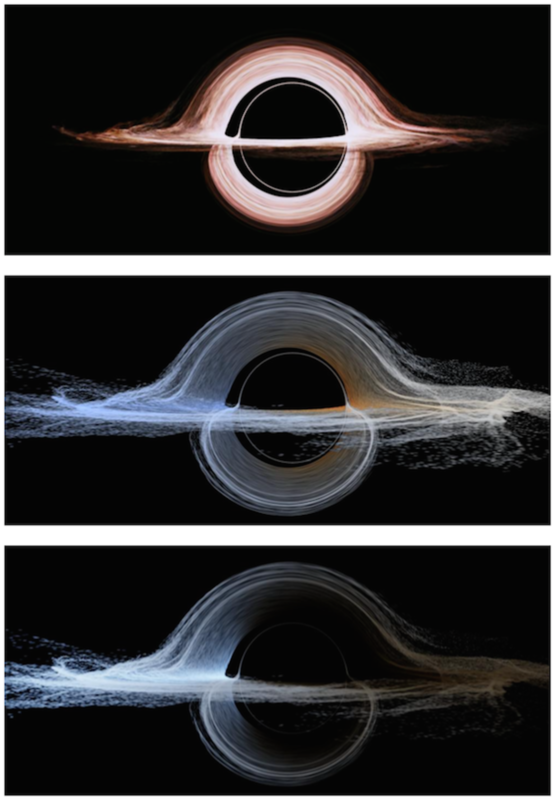 EDIT as per Thucydides suggestion: Here is a visualisation of a black hole from the film Interstellar using Kip Thorne's Kerr metric formalisation. The first is that actually used in the film. It is somewhat inaccurate for the sake of looking visually pleasing/simple. The next two images are increasingly realistic for moderate rotation speeds; they show redshift and a more realistic messy accretion disc. I understand this is intimidating and long but I felt everything I said here is necessary, for if any of it went unsaid somebody might ask about it later so I figure instead of making people ask for clarification I will make myself 110% clear. I promise you will not be disappointed if you take the time to read this answer. So to my understanding we want to know what you would see from the accretion disk of a black hole. I'm going to answer this in bits and pieces starting from the center to make sense of the chaos that occurs where a black hole is. The first and most important thing to consider is how sight works. Our eyes require light in order to see and perceive anything. Gravity from a black hole is so powerful that nothing beyond the event horizon escapes, not even light. This means that there would be a black blob in the center where no visible light escapes. While this sounds uninteresting it would really be quite mesmerizing as it is probable that nobody has seen such darkness in there lives, the effects on your eyes and mind are unknown. It would be an unspeakable experience. Beyond the center you wouldn't just see a blob with normal space behind it. We've already established the gravity affects light. so light coming from sources behind the "blob" (if nobody minds me calling it that) would all be visible in a ring around it. This would occur because any light that passes next to the event horizon would start to move toward the center of the black hole but would not be completely captured and would wizz away in a different direction than before. One might think you'd have to be at the right angle to see it as it is being forced in a random direction, but this is not the case. Light is coming from all around anyway and therefore no matter what angle you're at you will have light 'refracted' by the gravity and sent your way. So you would see a blob of uncomprehendable nothingness with a ring of blinding light around it. the ring would somewhat gradually fade outwards but would have a distinct edge on the inside as this is where the blob is destroying everything visible. Now we're outside the event horizon, beyond the ring of stuff thats not actually there, we move to the accretion disk, which is where our friends are. This is where matter, from around objects that either fell into the blob or passed close by, that has been trapped in orbit but not necessarily sucked into the void. some of it might eventually but that has no effect on our current issue. This matter could be any range of things, it could be mostly gasses, there might be some little asteroids, or maybe even some planets that our blob stole from passing stars, this all depends on the situation and size of the black hole. You mentioned a desire for a more impressive image so I'm going to do what I can to create that for you without defying physics (well physics as science currently understands). So the most awesome accretion disk we could hope for would have an accumulation of spherical asteroids/dwarf planets, like Pluto, and if we're lucky and they are far enough out that the heat isn't affecting them, they would be a little icy and would glimmer slightly in what little light is there, a comet or two, and in my opinion as little gas as possible. The reason I wouldn't want gas is because it would obstruct the view of the incredible nothingness that we call the blob. With that said what we have now is the 'blob', a ring of bright light immediately around it that fades rather quickly, and planets, comets and meteors with gasses floating around. Somebody could now argue that you wouldn't be able to see this very well due to a lack of light but heat does create some light and we already seem to have established that there would be a lot of heat here. Still, though, that's not enough light to make this impressive. At this point you can use creative license to say that in this vast void where everything is light-years apart and things take millions or billions of years to happen our friends are lucky enough that this black hole is currently luring in a star and has gotten it close enough that everything is lit up for the moment. What else is there to see, well we already discussed light coming from behind the blob but what about all around. Stars around would still be shining at you so the image we received before isn't totally accurate, there would not be total darkness outside what you see (or don't see) of the black hole. You would still have stars, however everything that passes through the accretion disk, even light, will be affected by the gravity, probably not completely displaced or refracted but still warped somewhat, and because it's all being drawn to the center of the blob all the light around you would seem to be turned that way and this would make the blob appear to be the center of the universe. Now we have stars all around seeming to be drawn to the blob, a nearby star illuminating the scene, icy planets and asteroids floating around through clouds of gasses all of it moving at different speeds depending on how fast it came into orbit a blob of breathtaking, mind-numbing nothingness with a ring of glorious light around it. But there is one last thing, not particularly anything more to see, but different from what you would normally imagine. We've discussed red shift but I'm not sure we fully understand it. One would assume that red shift means everything is slightly more red (i.e. green is now reddish green). This is absolutely untrue. Red shift is term referring to the way light waves are lengthened due to certain things such as massive gravity around a black hole. This means that light waves that have a wave length of 500 nanometers(nm) (this would be green/blue) would have a wave length of, say, 550 nm (more of a yellow) so to sum this up ultraviolet light you otherwise wouldn't see would now be purple light which you can see. otherwise purple light would be indigo, otherwise indigo: blue, blue: light blue, light blue: green, green: yellow, yellow: yellower, yellower: orange, orange: red, red: redder, redder: invisible infrared. and if the black hole is as massive as it would have to be for this amount of 'impressiveness' you'd probably have a red-shift far greater than 50 nm. but what people misunderstand most about red shift is that visible light is not the only light affected, ultraviolet rays will also stretch into visible wave lengths and replace any non-red colors that would otherwise be lost to redness. granted, ultraviolet is not coming from everywhere but where it is coming from would now be blues and greens and yellows. you would have a stunning and colorful cosmic view. To conclude, our friends are looking at a fantastically colored universe that seems to be converging into a total and unexplainable void, rimmed by radiant beautiful light and when they take a look around they realize there are many asteroids and planets moving around the void with them, and an occasional lost comet, all illuminated by the brilliant light of a bright blue star nearby. It is an incredible experience that they can never hope for anybody else to understand. P.S.- i looked into the previously mentioned view from 'interstellar' and It might be safer to assume that instead of a ring around the blob you might see that shape, but do not fear you will still see stars and trapped planets and asteroids if you are far enough out. so change it to a blob, with 'that shape' around it in bright light and a star lighting up planets and comets and whatnot. thank you :) I hope my answer is helpful and accurate. please comment if you disagree on anything. This site right here is a hella fun site because it provides a description of what you would experience as you approach the singularity of a Supermassive black hole. You can watch the video and then it shows each major change and describes what is happening in when you look at it. The images labeled "Innermost Stable Orbit" are probably the very edge of the accretion disk. Note that the red lines on the black hole are not actually visible... the author attributes them to your "spaceship" painting them on your visual display as a big massive warning to avoid that thing. Not the answer you're looking for? Browse other questions tagged physics black-holes universe light or ask your own question. How much energy does this sun crushing ship, the CrushSun, use? What astronomical considerations are necessary for the planet in this model to possibly be Earth-like? Is it safe to orbit HDE 226868? Travelling through a black hole like through a wormhole?